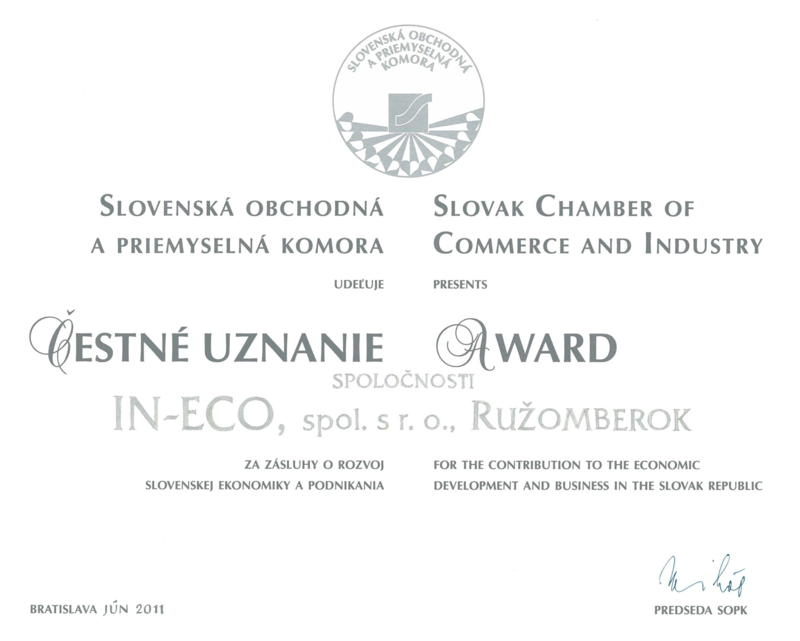 According to the proposal from Regional Chamber in Žilina (regional branch of the Slovak chamber of Commerce and Industry) Directory of the Slovak chamber of Commerce and Industry (SCHCI) approved the „Award“ for the company IN-ECO spol. s r.o. Ružomberok at its plenary session on 21st of June 2011 for the constribution to the economic development and business in the Slovak republic. The Award was taken over 18th of April 2012 by the chief executive of the company IN-ECO Mr. Igor Tomek from vice-president of SCHCI Ing. Juraj Kostolný and president of Regional chamber SCHCI in Žilina Ing. Ján Mišura.